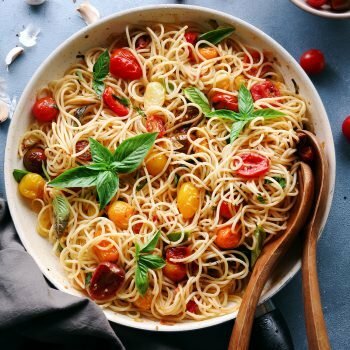 This simple pasta is ready in under 30 minutes and only has a handful of ingredients! It's the perfect dish for any night of the week and can easily be customized to include a protein of your choice. Vegan friendly with a gluten-free option. Recipe can easily be doubled to serve more people. Bring a pot of well salted water to a boil. Cook noodles just shy of al dente, a minute or two less than package instructions; they will cook more in the pan. Reserve 1 cup of pasta water from the pot and drain the noodles when done. While the noodles are cooking, begin making the sauce. In a large saute pan, heat oil over medium heat. Add garlic and stir around for a bit to cook, then add tomatoes. Cook together until tomatoes soften, about 4–5 minutes, pressing on a few of the tomatoes to release their juices and thicken the sauce. Careful not to cook over heat too high or the garlic can burn and add a bitter taste to the dish. Remove pan from heat until ready to add the cooked noodles.